Make sure you are using valid DOCTYPE, this is required for FancyBox to look and function correctly. This works with any html (images, text, headings, flash). The only caveat is it doesn’t currently work with AJAX. Whatever you want to zoom to must be html already on the page. Below are several examples. Width and height of zoom box are configurable through optional setting or css. The code below initialized the plugin and add the Zoom Effect to any a tag classed with zoom, and will show content relating to the id referenced in the href of the a tag. Just add rel=”prettyPhoto” to the link you want prettyPhoto to be enabled on. Slimbox 2 is currently the smallest Lightbox-like script available for the jQuery library. 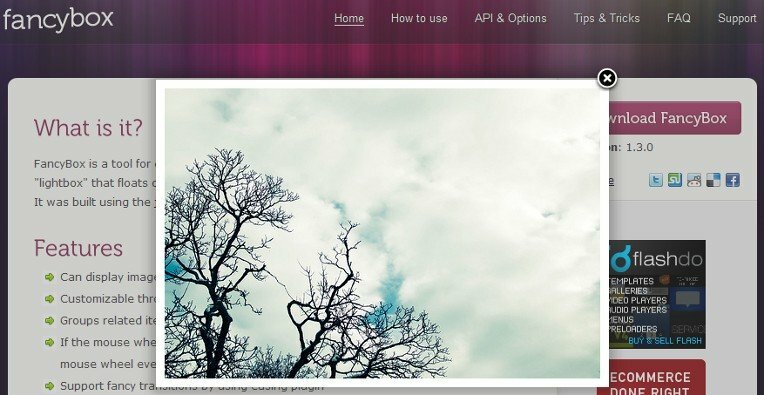 A light-weight, customizable lightbox plugin for jQuery 1.3 and 1.4. Allow users to create a customized lightbox that is unique to their project. Tested In: Firefox 2 & 3, Safari 3 & 4, Opera 9, Chrome, Internet Explorer 6, 7, 8. The colorbox method takes a key/value object and an optional callback. ColorBox will accept a function for any of it’s parameters. imgBox is a jQuery plugin that implements a smooth zoom effect on images. What’s So Great About this Plugin? First, make sure that there is a XHTML DOCTYPE declaration at the very top of the page then include necessary files. Load the dependency files. Make sure the jQuery is loaded first before the facebox plugin. While calling facebox() on any anchor tag will do the trick, it’s easier to give your Faceboxy links a rel=”facebox” and hit them all onLoad. piroBox is a versatile gallery plugin, with a choice of three styles (shadow,white or black). You can view your gallery as a slideshow or as single images and when an image is selected will automatically reposition the image in the browser window. Choose your style (shadow,white or black) and include one of the three .css in your header. Include jQuery.js, pirobox.js and pirobox options in your header. // in some cases of very large images or long description could be useful. This a jQuery equivalent for Lightbox2. Alternative to image popups that will display images in an overlay. All links that have attribute 'rel' starting with 'imagebox' and link to an image will display the image inside the page. Galleries can by build buy giving the value 'imagebox-galname' to attribute 'rel'. Attribute ‘title’ will be used as caption. You don´t need to modify your HTML markup to use jQuery lightBox plugin. Just use the power and flexibility of jQuery´s selector and create a set of related images. Supported Media: Images, Inline HTML, iFrame, AJAX, Video. For easy migration from Lightbox/Slimbox, by default the script activated for links with rel=”lightbox” e.g. Picbox includes an api and customisation options. Refer to picbox.js in the src/ folder for the full list, including descriptions. An overlay popup script for easily embedding flash video, displaying images, or showing html (either external sites via iframe or content on your own site via AJAX). Tested in Safari(4)/Chrome/FireFox(3.5)/Internet Explorer(6–8)/Opera(10). Note: Mobile Safari has an issue with fixed position. Before you can implement ThickBox make sure the page that invokes ThickBox has a valid DTD. This is required for ThickBox to look and function correctly. Go to ThickBox Homepage to learn the many different ways to use and invoke ThickBox functionality. While Thickbox had its day, it is not maintained any longer, so we recommend you use some alternatives above. nice post, I think I love it. But all in all in my opinion there is no lightweight solution. So I created a Lightweight Lightbox which works without Frameworks, is responsible, can be load async, is W3C compitable and many more with just a source of compressed code of 2KB! I would love to that you check out my project under http://www.xopt.de and maybe you can still refer it or leave me some comments.